Sylvia had the opportunity to view a photograph of an older Doukhobor couple kissing as part of the collections held at the Touchstones Nelson: Museum of Art and History. This unassuming black and white image became an inspirational point for her project. The image shows a past era - the 1950s - when Nelson, BC Canada wasn’t yet defined as a tourist or cultural destination. The photograph of Nelson’s “kissing couple” is iconic. It’s equally as interesting and dynamic as some of the best-known 20th-century images taken by photojournalists in the same time frame. Photographer, Robert Doisneau (1912-1994) was commissioned by the French government to capture a series of couples kissing across Paris to show the positive World War II recovery process in the city as people returned to the streets, optimistic and hopeful. One of Doisneau’s most iconic portraits was made near the Hôtel de Ville, showing a couple embracing and kissing in the city centre. The couple became a symbol of love in Paris – and its powerful imagery endures today. Can an artist enrich Nelson’s status as a cultural capital? Can Nelson be the new Paris of the North—a city of love? As part of her project she wanted there to be an opportunity for the city of Nelson itself to be pictured in the artwork – and share the limelight as a key locale beyond a recreational site. Often portraits of kissing couples are at the centre of the image and the background is less visible or hidden. In the Nelson series, she created 360-degree panoramas so viewers can navigate around the portrait as well as explore the surrounding cityscape. The portraits themselves represent a new chapter in the city of Nelson. They further represent an artistic space where the streets of Nelson and its people are powerful dynamic subjects rather than still forms in a photographic image. Importantly, the project recognizes and respects the fact that the city of Nelson is diverse, with communities encompassing First Nations, young families, recent immigrants from Syria, to a thriving lesbian and gay community. Like the photo of the Doukhobor couple – the image shows that love and peace are powerful and uniting symbols. As south of the border in the USA where there are struggles with civil liberties, Nelson, BC, Canada can readily show how diverse, embracing hopeful and creative places can thrive. Ultimately through Sylvia's net art series, the Kissing Project, the city itself is now a living art installation, one that anyone can access through Google Street View. I was interested in participating in the project, since April 7th (the day of the shoot) was my 38th wedding anniversary. 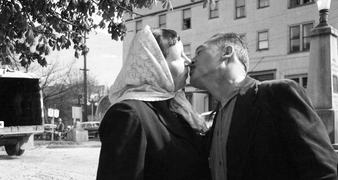 My husband and I hope to be the new Doukhobor couple in relation to the Touchstones' archival image. Our image has been shot in the very location of the Touchstones’ image and with this image we hope to share our love with others. My dog, Suki, is my kissing buddy. I've had Suki for 13 years as of Christmas. I wanted to take the photo on Baker Street because that's where I make people happy! I make cookies or flatbread and give these out to homeless people. When I take Suki with me almost every one recognizes her on Baker Street and loves her company. cream there. It’s the centre of town, and the meeting place for so many. To us - it’s really amazing that the shop still maintains its original layout. The staircases are a iconic reminder that we live on a mountain. These stairs used to be insurmountable when the kids were small and now they can run up them! Time flies with each step. We feel so fortunate to have this astounding, inspirational, wonderous waterfall so close. And we're horrified the City of Nelson is considering developing the site with housing. Cottonwood Falls and Park is for THE PEOPLE of Nelson and its visitors in this alarming time of ever decreasing natural space. Peter's writing a book on Modernist Nelson architecture and we have come to appreciate so many of the diverse dwellings in the city. The one we have been photographed in front is a favourite since it has an amazing view of the lake and the street below. This is one of Shadow's favourite places to go for a walk, and it was also in this very location that my fiancé and I decided that Nelson was home. We hoped to be portrayed at dock’s end in order to illustrate our two cultural paths coming together. I’m from France and Jordan is from Canada. This location is special because our kids have gone on to perform on the Capitol Stage. We have fond memories of the theatre, and it’s a great space. I also wanted to be pictured here as Dave is such a hockey fan – if he had his way – we would have been pictured on centre ice at the rink. Over the last 4 years, Kootenay Co-op Radio has woven its way into our lives. Being new to Nelson in 2013, Stephanie coaxed me to volunteer at the station. I walked through the door and ended up on air with Kootenay Morning, KCR's current affairs show. 2 Years later, Stephanie landed a job at the station. Today, we co-host a show together. For us, KCR is truly "Radio from the Heart." Sometimes love goes beyond the page…. This is a special location to us both as we like to go to Bibo restaurant. My daughter and I have a pretty special relationship, starting on the day I first met her in China. I try to kiss her as much as I can. This location is very special to us because, when we were on our first date a couple years ago, we went for a long walk and cuddled up on this bench. It was kind of the first time I realized how much I really loved the guy :) Thank you so much for doing this project! It's a great way to spread some love and good vibes around our community. My daughter and I have a lovely mother - daughter relationship. We wanted to share the joy of family and chose to have our photograph taken in front of Burrell store to celebrate the neighbourhood we have lived in for the past 18 years. “Oxygen’s artist in residence invites participation in the Kissing Project” Valley Voice, New Denver, BC, Feb 9, 2017 vol 26. No.3 p16.